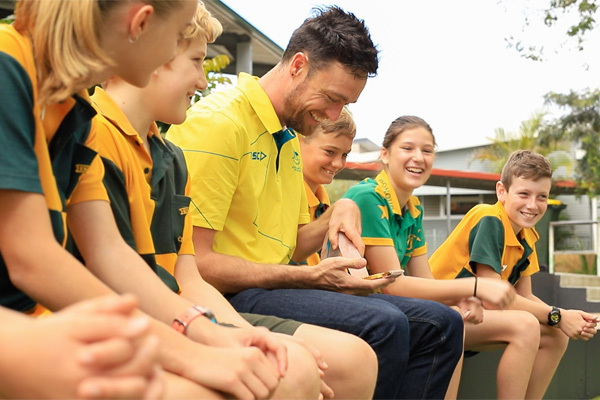 Nundah local and Paralympic gold medalist, Simon Patmore, has finished a speaking tour of several Brisbane schools to discuss goal-setting, bullying and resilience. Simon, who won gold and bronze in snowboarding events at the Pyeong Chang Paralympic Games this year, broke a 16-year gold medal drought for Australia and became the first Australian male athlete to win medals at both the summer and winter Paralympic Games. Simon attended St. Patrick’s College’s leadership retreat in October where he talked to year 11 students about resilience and leadership. Andrew Pashley, House Dean and Teacher at St. Patrick’s College, said the students responded very positively to Simon’s visit. “As an Old Boy of the College, Simon had an immediate connection with the boys but this connection was further strengthened by Simon’s engaging presentation,” says Andrew. Simon also visited year 6 students at Brisbane northside schools to discuss resilience and strategies for transition as they move to senior schooling. “Moving to senior schooling can be a challenge for some students. I spoke to the students about ways to build their resilience and how to cope with the change from primary school to secondary school,” says Simon.